Red Lodge offers many attractions. Stroll through one of the local art galleries, take a walking tour of the historic district, visit the museum or explore one of the many parks or drive the Bearthooth Scenic Byway. Beartooth Art Gallery. 110 S. Broadway, Red Lodge, MT 59068. Phone: 406-446-1292 or 406-425-2476. Common Ground Western Art and Gifts. 3 N. Broadway, Red Lodge, MT 59068. Phone: 406-446-2800. City Park. Located on the east bank of Rock Creek at 19th Street. Picnic tables, barbeque grills and restroom facilities. Visitor's Center Picnic Area. Located at the intersection of Highways 78 and 212. Picnic tables, water and an RV dump station. 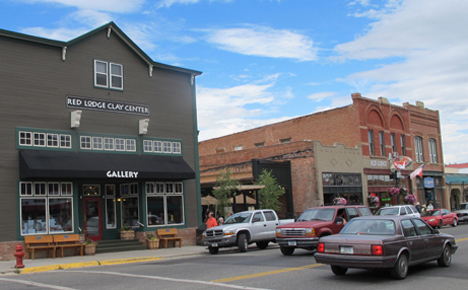 Pick up a map at the Chamber of Commerce to explore the historic buildings and homes in Red Lodge. Carbon County Historical Society Museum. 224 N. Broadway, Red Lodge, MT 59068. Phone: 406-446-3667; Fax: 406-446-1920. Custer National Forest. Beartooth Ranger District - HC 49, Box 3420, Red Lodge, MT 59068. Phone: 406-446-2103; Fax: 406-446-3918. Custer National Forest is one of the gateways to Yellowstone National Park and one of the largest intact temperate ecosystems left. The Beartooth Mountains offer spectacular hiking and fishing and the Beartooth Scenic Byway provides awe inspiring views as the road winds upward of 11,000 feet. Gallatin National Forest. Gardiner District - 805 Scott Street, Gardiner, Red Lodge, MT 59030. Phone: 406-848-7375; Fax: 406-848-7485. Established in 1899, the Gallatin is part of the Greater Yellowstone Area and is the largest intact ecosystem in the United States. This forest consists of 1.8 million acres spanning six mountain ranges and the Absaroka-Beartooth and Lee Metcalf Wildernesses. Native wildlife refuge caring for animals that were injured, orphaned or so humanized that they could not survive in their natural habitat. Roman Theater. 120 S. Broadway Avenue, Red Lodge, MT 59068. Phone: 406-446-2233. Located in Custer National Forest, this byway crosses the Beartooth Mountains providing access to the northeast entrance to Yellowstone National Park. This byway is the highest elevation (topping 11,000 feet) in the Northern Rockies offering spectacular views and unlimited outdoor recreation. Allow two to three hours to drive the 68.7 miles (110.6 kilometers). Cooney State Park. Phone: 406-445-2326. GPS: 45.442; -109.205. Open year-round, this park is a popular recreation area. A concession stand sells snacks, beverages, firewood, bait, ice and emergency items for boats. An information kiosk, extra vehicle parking and playground are also available.